The aim of this article is to examine ways in which trade directories can be used to study the social history and geography of Preston by examining one particular directory: the 1885 Barrett directory of the town. The Barrett directories in the Harris reference library in Preston cover a period stretching from the 1880s to the 1960s. They supply data about individuals in three separate categories: by surname, by business/occupation and by street. No explanation is given in the directories of the criteria used to decide which individuals should be included in the surname section. It would appear to favour the more affluent section of the community. The business and professional sectors are well represented; the tens of thousands of cotton industry workers seriously under-represented; and groups such as domestic servants totally invisible. The 1885 Barrett directory’s alphabetical list of persons for Preston was assembled in a spreadsheet consisting of more than 9,000 records: mostly individuals, nearly all appearing to be heads of household, but also including a little over 300 businesses, virtually all run by people included in the same section. Each record showed some or all of the following: surname of individual; first names; status (marital and professional); letters after name; occupation; full address; name, address and description of any business the individual was involved with; whether they had an advert in the directory. In addition there were two categories that proved especially useful. The first identified by means of a ‘j’ after the name those individuals who were journeymen – those (all men) who were time-served manual workers but who were not self-employed. There were 508 men in this category and it seemed that a study of their addresses might point to districts in the town favoured by skilled manual workers. The second interesting category distinguished whether the address given was the home or business address of the individual. There were 937 ‘home addresses’ – generally business or professional people who did not live ‘over the shop’ – and again it seemed that a study of these addresses might help to identify those districts favoured by the better off. These two categories appeared to be less problematic than other occupational categories: ‘journeyman’ appears to be fairly unambiguous, and the possession of both business and residential properties would seem to indicate a certain minimum level of affluence. 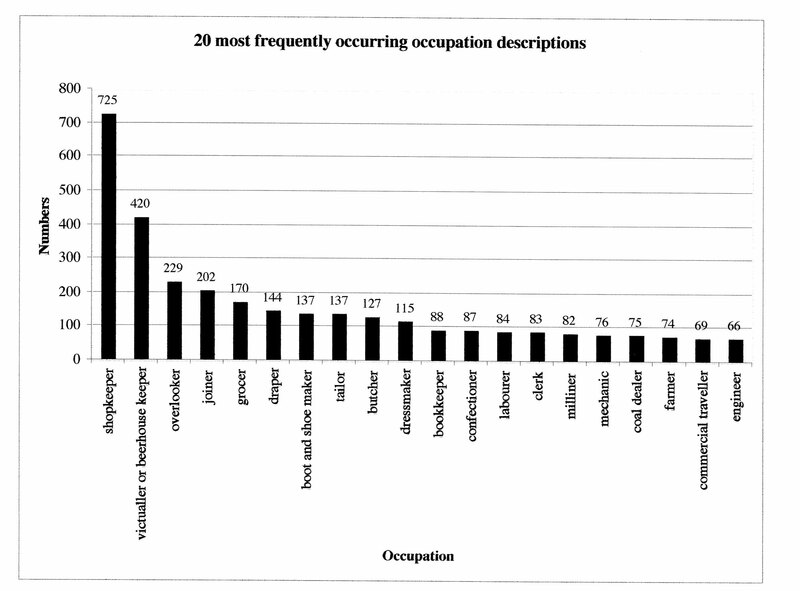 Other occupational descriptions, for example the various trades, can include wide variations in affluence and status among those they designate. So it seemed that identifying the areas where those with ‘home addresses’ lived might establish the more affluent areas of the town and uncovering the homes of the journeymen could reveal the upper working class districts. None of this social geography is obvious from the present layout of the town: areas now described as socially deprived were once the home of the upwardly mobile. In the 1880s Preston was expanding rapidly, with new, usually terraced housing appearing in several districts. Is the directory data sufficiently reliable to use in mapping the social geography of the town? The first point to make is that the evidence does not have to be exhaustive: there could well be more journeymen in the town than those found in the directory, but if we have sections of the town favoured by our 500 journeymen and other sections in which none are found this can probably be taken as indicative of the social composition of those districts. The best test of directory accuracy is probably that suggested by Norton: ‘In general, when a directory is printed and published in its own locality … part of a series appearing regularly over a number of years, it can be expected, prima facie, to be reasonably reliable.’  The Barrett’s directory was produced in Preston throughout its life (the firm’s office was originally in Deepdale Road and later in Lune Street), and it appeared regularly for over 80 years. Such longevity testifies to reliability and, unlike census data which by its nature is private and difficult to verify, the directory information is on public display and mistakes would anger and possibly damage individuals who could easily make their feelings known to the compilers. Internal evidence also suggests a high level of professionalism in the production of the directory: computer spell-checking the text from the 234 pages revealed only a handful of setting errors. This indicates that the text was carefully proof read; such attention to detail is expensive and would be shirked by a careless compiler. If we accept the usefulness of the directory entries in supplying pointers to the social geography of late 19th-century Preston, how do we best make use of them? The directory contains a town gazetteer listing virtually all the streets: it is not totally accurate since new streets were appearing even as the directory was being printed, and projected streets were not always built. The directory is not alone in this: the various maps of the town of this period, including the wonderful 125” OS, omit some streets and plot others that were never to exist. The gazetteer was added to the spreadsheet and supplied 1151 streets. Next, the town was divided into 500-metre squares based on the modern OS grid and each street allocated a 4-figure grid ref and a quadrant identifier, for example, 5530SW. Where a street straddled two 500-metre squares it was assigned to the square which contained the most houses shown on one of the large-scale OS maps of the period. Where a street straddled several squares, as with the main shopping streets, the street directory section of the directory was used to allocate stretches of street by house number. Modern numbers could not be used because, frequently, streets have been renumbered. Instead, surviving physical evidence, such as street junctions and pubs, was used to make sense of the nineteenth-century street numbering. Where confusion remained, help was often supplied by the custom of the town’s builders of allocating a ‘terrace name’ to groups of as few as two houses. This solved problems in New Hall Lane, which stretches east from the town centre for the best part of a mile and contains nearly 30 separate ‘terraces’. These can be identified on the map, and often on the ground, and their separate numbering fitted into the overall numbering of New Hall Lane. Having amassed this vast amount of data, the next stage was to analyse it. The directory contains 9,342 entries for Preston in the alphabetical listing of Prestonians. An initial difficulty was to decide how to treat this raw material. One way would be to follow Manfred Thaller’s urging to be completely faithful to the source. This would mean allowing the spreadsheet fields to be loose enough to capture the full richness of the original material, accepting the resulting clumsy structure as a necessary concomitant of the messiness of reality. This seemed overly puritanical and promised to render too complicated any attempt at analysis. For example, the directory typesetters used abbreviations as and when needed to avoid line turns where possible. This meant that streets, road and terraces could appear in full or as st., rd. and ter. – there was no style requirement. If such abbreviations were not expanded it would render any later filtering and sorting of data more difficult. This may seem a minor point, but Thaler’s prescription would seem to be an all or nothing one – it is in facing such minor points that one sees the limitations of his source-orientated approach. The dangers inherent in ignoring Thaler’s strictures can be seen in the abstractions from the census enumerators’ reports where every individual is allocated to one absolute occupational category, which may be far from an accurate description of the working life of many who followed additional, often very diverse occupations. To minimise alterations to the original data, abbreviations were expanded where appropriate, otherwise they were left in place. Similarly, there was a certain amount of duplication in the material resulting, for example, in a person appearing twice: once in his capacity as an individual and secondly as a member of an organisation. Thus, Anthony Hewitson appears twice, firstly with a full description of himself as a publisher and secondly attached to the entry for his newspaper. The second contains nothing that does not appear in the first, and so was excluded. Where a second record added additional material to the first, the two were consolidated in one record. This resulted in a total of 9151 records. In 153 of these a particular individual could not be identified, as for example in the bald entry, ‘Preston Soap Co., soap manufacturers, Sizer street’. These records were also excluded. This left a total of 8998 records, each relating to a particular individual. Analysis of the 8998 records showed that they included 7344 males and 1654 females. Of the women, 1137 were identified as married or widowed, 465 as unmarried and 52 had no status description. The designation ‘Mr’ was applied to all men who had no other occupational description and probably suggests a relatively high status. Other status descriptions are more helpful: the 44 ‘esquires’, the 14 military officers and the 80 church ministers can be more easily socially categorized. Similarly the various letters after individuals’ names furnish clear status descriptions, representing university degrees and professional qualifications, and indicating magistrates. There are 919 separate descriptions in the occupation category, plus a ‘not given’ description for the large group of 1280 individuals for whom no occupational description is supplied. Additional occupational information is supplied for 2474 individuals: in some cases this merely supplements the initial ‘occupation’ description; in many others it describes a complementary activity (a draper, for example, may additionally be described as a costumier and silk mercer); other alternative employments seem oddly married, as in the case of Robert Coward who carried on the trades of hairdresser and umbrella maker from the same address. None of this variety is captured in the census abstracts, which also fail to capture the information contained in the next directory category which designates whether a worker was a journeyman. The census abstracts also have no category to distinguish between home and work addresses, a category which the directory supplies and which forms one of the next six spreadsheet categories which give house name, street number, ‘street, district, grid reference and the ‘home’ category. This last category needs some explanation. In the alphabetical list of persons in the directory some 926 entries have the abbreviation ‘h.’, often but not always distinguishing a residential from a business address. Sometimes the ‘h.’ is used when no other address is given or the business address given is the same as the home address; many other addresses are clearly home addresses but do not have the ‘h.’ abbreviation. The use of the abbreviation seems to imply a higher status: it is, for example, applied to none of the homes of the 508 journeymen but is applied where the occupier appears to be self-employed. The next eight spreadsheet categories give information about the business or organisation an individual was involved with, followed by a category showing whether the individual had an advert in the directory, a ‘miscellany’ category to catch any additional information, a ‘notes’ category for any comments and two categories giving source details. It is not suggested that the data collected in these categories be used for quantitative analysis – it has not been possible to discover what criteria governed appearance in the directory – but it can be used to point to areas which would be worth researching in other sources. A selection of graphs abstracted from the directory data are shown below to give a more graphic overview of the data. Figure 1 illustrates some of the limitations of directory data. The 84 labourers are but a tiny fraction of the number of labourers employed in the town: why are they in the directory? The largest single category by far is that covered by the simple description ‘shopkeeper’: what did they sell, and how did their trade differ from all the other shopkeepers whose trade is more closely defined? If all the retail outlets were grouped together they would dwarf all other categories in the directory. This cannot be done with confidence using data from the ‘surnames’ section of the directory, since it is not always clear whether an individual dressmaker, for example, also has some form of shop at the address given. Constructing an additional spreadsheet from the businesses section of the directory could help untangle this difficulty. 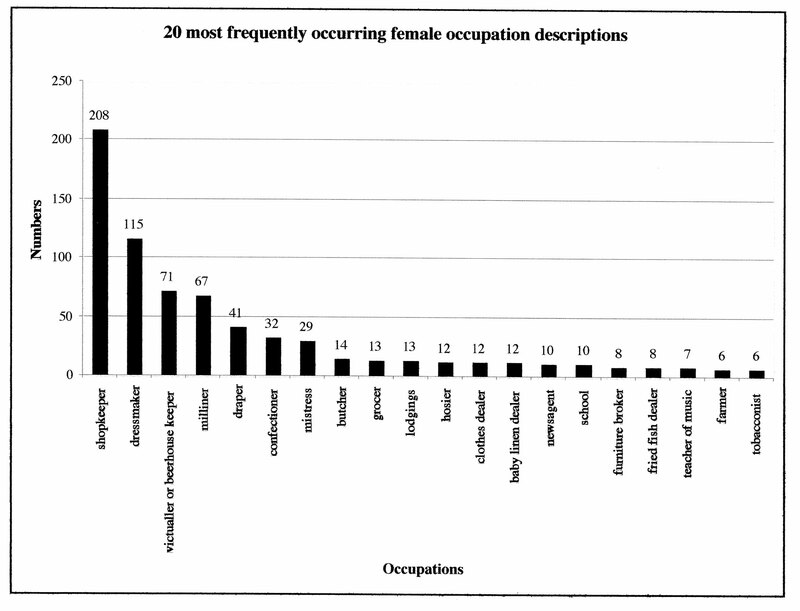 Figure 2 gives an indication of the occupations open to some women: almost always in the service section. The 29 ‘mistresses’ are school teachers, as are probably the ten women designated by ‘school’, seeming to be the proprietors of small, private schools. This graph, of course, gives a totally false picture of the working lives of most women in the town. More than 16,000 women were employed .in Preston’s cotton industry at this time, according to census returns. Add to these the close on 2,500 female domestic servants, and the limitations of the directory as a means of conveying the full extent of female occupation become apparent. 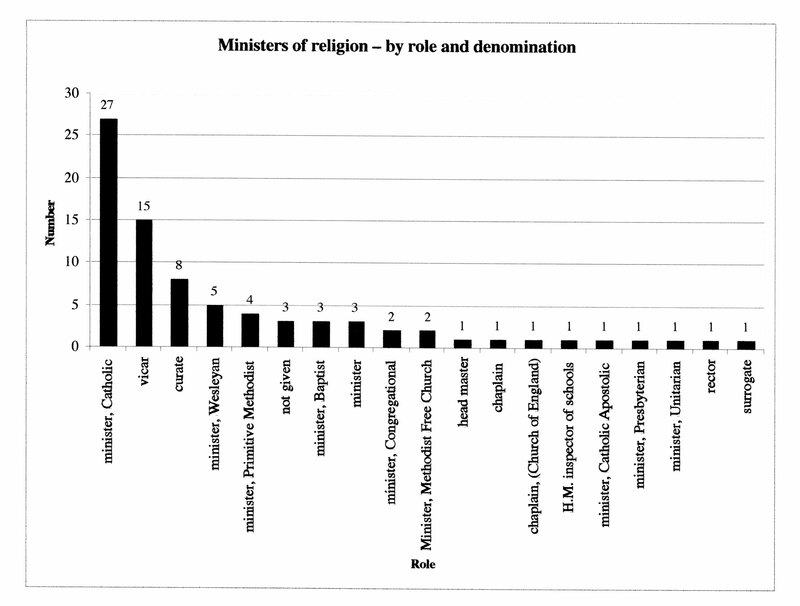 Where the directory entries could prove useful would be in a study of the service sector: plotting the distribution of dressmakers around the town, for example, and in examining which occupations were favoured by married or widowed women and which by unmarried women. The totals for these directory entries and for the census abstract almost correspond: 49 and 48 respectively. The slight discrepancy could be accounted for by the joint deputy clerk of the peace in the above table. He is shown in the directory to be living in Southport, which would mean that he would not appear in the census abstract table for Preston, but certainty that the figures really do correspond would require much closer examination of the two groups. Similarly, there are 38 individuals in the ‘barrister, solicitor’ category in the census table, whereas the directory lists two barristers and 63 solicitors, a total of 65. Part of the discrepancy could again be accounted for by Preston solicitors commuting to work from their homes outside the town, but again closer examination would be needed. And again, the census table has 40 individuals in its ‘farmer, grazier’ category, whereas the directory lists 74. It would be useful to extract the relevant information from the 1881 enumerators’ returns and map the two sets of figures, census and directory, to discover where the discrepancies occur and whether, for example, the ‘farmer’ discrepancy is owing to the two sources working to different geographical boundaries; this is likely, since many of the directory farmers are in Fulwood. What these discrepancies do show is that it can be dangerous to attach too much reliance to the census abstracts: their printed, official format lends them a possibly spurious authority. Occasionally, a correspondence appears to be strong as in the case of innkeepers and beersellers. In the census table these are grouped in two categories: ‘innkeeper, hotelkeeper and publican’ and ‘beerseller, ale, porter, cider dealer’ and total 424. In the directory they are grouped under ‘victualler’ and ‘beerhouse’ and total 427. One difficulty is that whereas the second total is unambiguous in that each entry has an associated pub name, in the census table it is not clear if some of the various ‘dealers’ really were publicans, they could have been ‘off-licence’ style businesses. If the quantitative use of demographic data is problematic – whether it is taken from directory or census, or from a combination of both – a more qualitative use can prove illuminating. It was suggested earlier that some of the directory information might be used to map the social geography of the town. 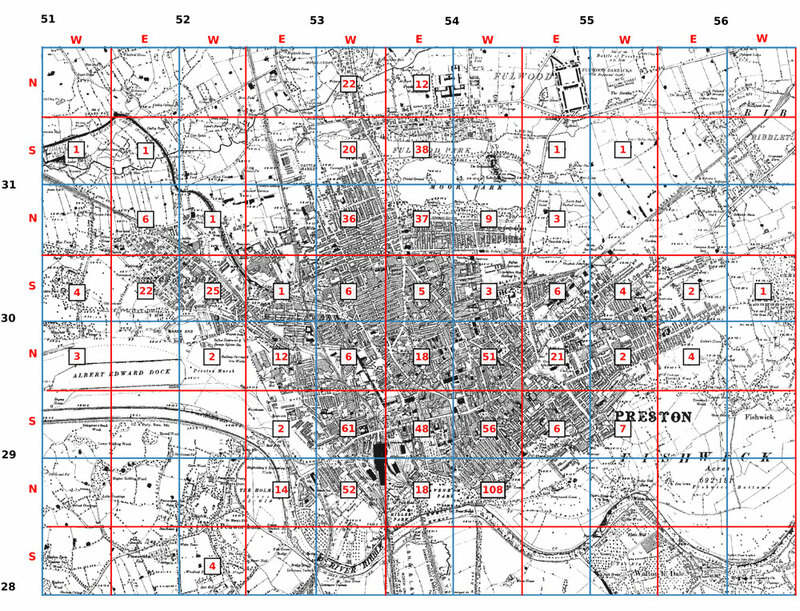 The data was mapped to 500-metre squares based on the modern OS grid. Two other systems were considered: administrative boundaries and principal streets. Administrative boundaries were rejected because they change over time, they are far from uniform and they are political rather than purely geographical constructs. The grid system has the advantage of being arbitrary and of being applicable to comparative studies of other communities, population densities can be calculated based on fixed criteria. The other system, using principal streets, was suggested by a study of social segregation in eighteenth- century Leiden which attempted to overcome the limitations of administrative boundaries by including streets with over 75 households. The drawback of this approach, as far as Preston is concerned, is that such principal streets, because of the historical development of the town, tended to be the homes of the more affluent sections of the community. Step away from the principal thoroughfares of Fishergate, Church Street, and Friargate and meaner housing is found fitted into the medieval burgage plots. Omitting these small courts would seriously distort the social geography of the town. This situation is described more fully in Nigel Morgan’s work on housing in nineteenth-century Preston. The following maps give an indication of the geographical analysis that can be garnered from the data. Fig.4 shows the grid square location and number of the residences of those individuals given a ‘home’ address in the directory. It does not include those living outside the map area or those whose address could not be identified precisely. The map is the 1895 6in OS with the modern OS grid superimposed. The map shows a heavy concentration of 108 homes of the more affluent (as defined above) in the Avenham district south and east of Winckley Square (grid ref: 5428NW): this grid square was also the location of what would have been the incredibly foul smelling Frenchwood tannery. They are well represented in the new suburbs created in Ashton in the west (5130SE and 5230SW) and Fulwood to the north (5331SE and NE) but scarce in the new suburb of Ribbleton developing to the east of the 55 grid line, in which direction the prevailing south-westerlies would drive the smoke from the town. Fig 5. 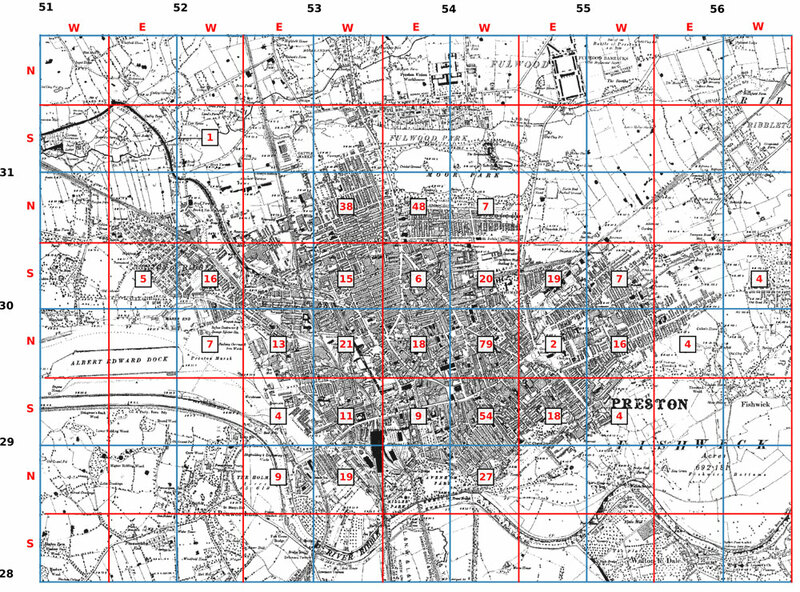 The grid square location and number of the residences of those individuals identified as journeymen in the directory. It omits four whose addresses could not be identified precisely and three beyond the map boundary. The map is the 1895 6in OS with the modern OS grid superimposed. Two points occur in comparing the two maps. Firstly, the concentration of 108 relatively affluent households in grid square 5428NW in the old part of town is not exclusive: there are a good number of journeymen households in the same district. Secondly, as new housing estates were developed to the west and north they became more exclusively ‘affluent’. This is clearly seen in the Fulwood developments to the north where journeyman households are totally absent. In the Ashton district to the west this developing exclusivity is less apparent in the grid presentation above, but a marked division in the type of housing from working-class to middle-class can still be seen on the ground as one moves north-westwards through the district. The overall impression from the maps is of a developing social divisiveness as the more affluent abandoned their traditional districts in the older parts of town and predominantly working class districts appeared to the north and east. This article has aimed to demonstrate that business directories, particularly from the late-19th century onwards, can supply a fruitful source for historians. There does not appear to be another demographic source to rival it for the study of larger towns: census data is difficult to acquire in bulk as Anderson’s study of Victorian Preston clearly demonstrates, and the Mormon digitisation is available only for 1881. Beyond 1911 no census information is available for individual households, so the directories are the only source. The Preston directories could prove particularly useful with later editions of the Preston directories which contain lists of what appear to be all the household heads in every street, together with their occupations. This information is available for the town throughout the first half of the twentieth century. The analysis here is admittedly rather superficial, designed to illustrate the usefulness of the directories as a source, but it does suggest possibilities for further research, especially if assisted by GIS software. For example, such software should facilitate projects such as measuring the travel to work journeys of various groups in the community; measuring the distances between the home addresses of criminals and areas in which they committed their crimes; or examining the extent to which the development of tramways to serve the affluent outer suburbs encouraged ribbon development along the routes. General and Commercial Directory of Preston, Blackpool, Fleetwood, Lytham, St. Anne’s, Poulton-Le-Fylde, Garstang, Longridge, Walton-Le-Dale, Leyland, Croston, and Adjacent Villages and Townships (Preston: Barrett, 1885). M. Thaller, ‘The Need for a Theory of Historical Computing’, in History and Computing II, ed. H. Diederiks, F. van Dejik, and C. Harvey (Manchester University Press, 1989). Anthony Hewitson, History of Preston, reprint of 1883 edition (Wakefield: S. R. Publishers, 1969), 537. General Register Office, Census of England and Wales, 1881, vol. III (London: Eyre and Spottiswoode, 1883), 355–62, https://ia800208.us.archive.org/7/items/cu31924063571123/cu31924063571123.pdf. H. Diederiks and F. van Dejik, ‘Social Segregation in Eighteenth-Century Leiden’, in History and Computing II, ed. P. Denley, S. Fogelvik, and C. Harvey (Manchester University Press, 1989), 174. Nigel Morgan, An Introduction to the Social History of Housing in Victorian Preston (Preston Curriculum Development Centre, 1982); Nigel Morgan, Vanished Dwellings (Preston: Mullion Books, 1990); Nigel Morgan, Deadly Dwellings: Housing & Health in a Lancashire Cotton Town, Preston from 1840 to 1914 (Preston: Mullion, 1993).